Please your eyes with bright colours on Diamond Strike Slot, a creation of Pragmatic Play. Enjoy this superb game at Wicked Jackpots! It comes with 5 reels and 15 paylines, revolving around diamonds and fruits. It is set against a dark blue backdrop, with flashes of lightning above. On the reels, you can find different symbols such as Cherries, Bells, Red 7, Plums, Lemons and Watermelons. Load Diamond Strike Slot at Wicked Jackpots on a mobile phone or PC, as it adjusts to any type of display. Start by placing your bets using the – and + buttons on Diamond Strike Slot. You can also pick your preferred bet level and press the Spin tab. A win is awarded with a combination of 3 or more identical symbols. Go for 10, 20, 30, 50, 70 or 100 automatic games with the Auto Play feature. Other settings are available to cancel Auto Play at any time you wish to do so. Bet Levels: Play with 1 to 10 betting levels. Amount of Paylines Selection: All 15 paylines remain active and cannot be adjusted. Coin Values: Find the following coin values - £0.01, £0.03, £0.05, £0.10, £0.20 and £0.50. The White Diamond represents Wild and substitutes for any symbol, except Scatter on Diamond Strike Slot. 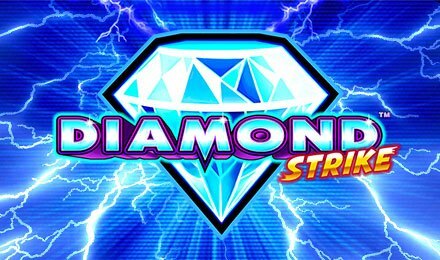 During this feature on Diamond Strike Slot, pick a White Diamond to uncover a Jackpot symbol. Match 3 Jackpot symbols to win the corresponding jackpot. Watch out for the scattered Free Spins symbol which generates free rounds! When 3 such symbols showing up on reels 1, 3 and 5, you can earn 8 free spins. Special reels are used during this feature. As it begins, extra White Diamonds are added to all the reels. It is also possible to retrigger an unlimited number of free spins. Land 3 more Scatters on reels 1, 3 and 5 to receive 8 extra free games that are added to the initial ones. Enjoy a sparkling gameplay on Diamond Strike Slot at Wicked Jackpots. Best of luck!